That is holy smoke you see rolling over the barbecue stand in Knollwood. Dale Bryant thanks the Lord for leading him to the smoked meat business, and business is booming at Smokey D’s Bar-B-Q in the little suburban community north of Sherman. He asked the brothers in his church, New Hope Christian Fellowship in Denison, to help him pray for a way into the barbecue business. 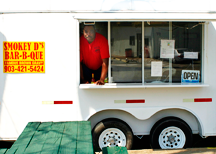 It must have worked, because about a year ago, some residents of Knollwood asked Bryant if he would open a barbecue stand in a little trailer they owned across from the gas station and liquor store that constitute Knollwood’s business district. 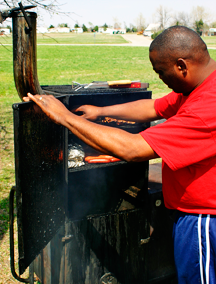 Dale Bryant works the smoker behind Smokey D's BBQ stand in Knollwood. 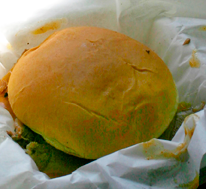 Bryant said about 80 percent of the people who buy a sandwich or a plate from him ask for the spicy brown gravy sauce. What is the secret to the sauce? He is not talking. He is one of many in the barbecue business in Texoma who cut their teeth on PO Sam’s barbecue in Colbert “back in the day.” He said his mother would take him over there, and he was introduced to the spicy brown gravy at an early age. His version is a close cousin to PO Sam’s gravy, so it is no surprise that many people visit Smokey D’s to purchase the gravy sauce in half-gallon containers. There is a pot of it bubbling on his stove at all times. While Bryant sells plenty of potato salad as a side dish, he will be quick to tell you that it is the brown gravy that is truly his barbecue’s No. 1 sidekick. Some people may think having a shoeshine is simply about improving or restoring the appearance of their shoes, but don’t you believe it. If Willie Riles, who has been bringing up the shine at Kelly Square in Sherman for 18 years, has ministered to their needs, they know that it is about something more, including a smile and an entertaining conversation.